A miniature honey bee colony or what beekeepers call a Nuc, is a living organism that needs to be cared for properly for it to survive and thrive in your bee yard. 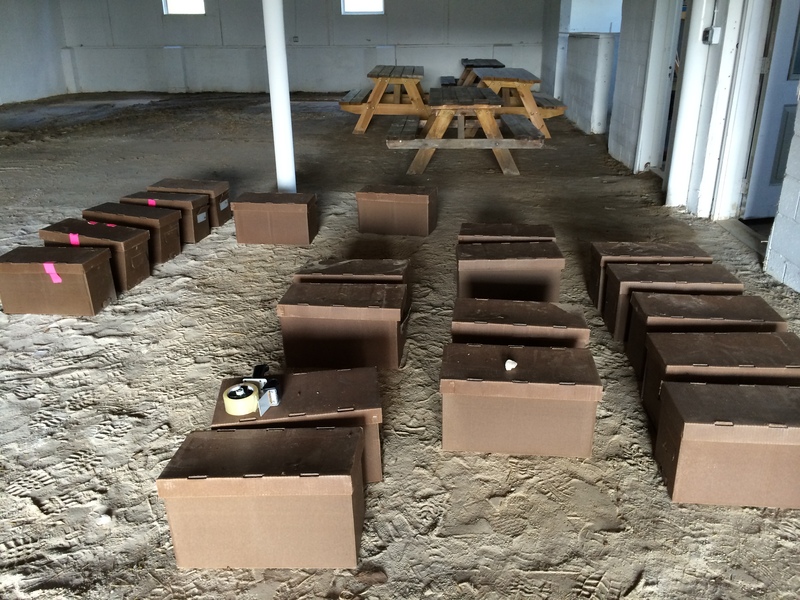 A “beehive in a box” is the best way to give your beehives the quickest start right from the gate to start producing honey as they already have a laying queen who is mated, producing eggs, and ready to go. 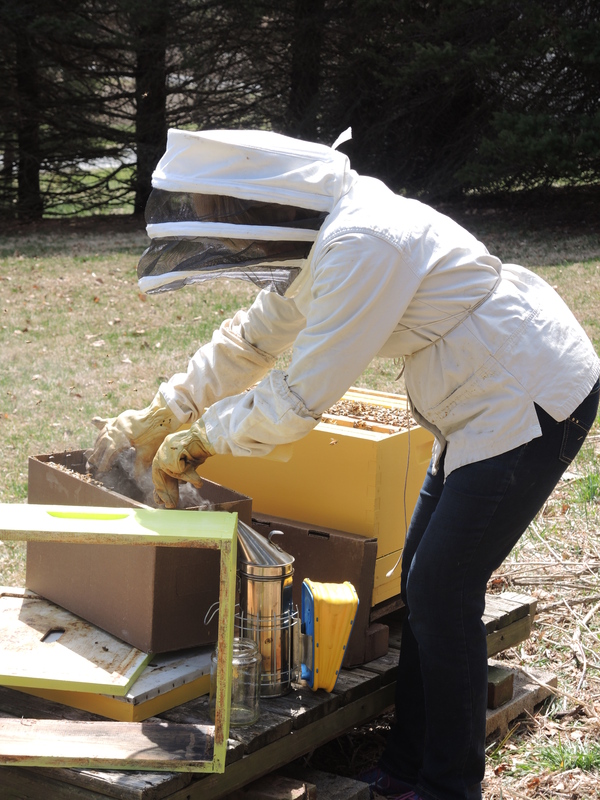 For beginning beekeepers, there are three different ways of starting your own hive: Packages, Nucs, or a Live Hive. To get an overview of Beekeeping, it’s costs, benefits, and problems, go to my post, Beekeeping Start-Up, Jump into the World of Beekeeping. To see how to hive a package, go to Bee Packages Are Here! Live Hive- This is probably the most difficult to purchase. Never buy a live hive until it has been thoroughly inspected by a state apiary inspector and given a clean bill of health. This might be a good approach for instant beekeeping, but you have to find a beekeeper willing to sell a complete working hive and you are unlikely to find one unless the beekeeper is retiring or has passed. Very few beekeepers want to sell a good, live hive and there must be a compelling reason to do this. However, when you are able to purchase a live hive, you are also purchasing all the existing problems such as small hive beetles, tracheal mite, varroa mites, wax moths or diseases such as nosema, American Foul Brood or European Foul Brood, etc. For small hive beetle controls, go to Small Hive Beetles to see how to combat these pests. Before committing, inspect the combs to see how healthy the colony is with plenty of brood and bee bread present on the frames. Bee bread is pollen brought back to the hive that is mixed with nectar and deposited into cells to feed the developing brood. 2. Packages- Packages have been the way beekeepers in the North have received bees from the South for over 100 years. 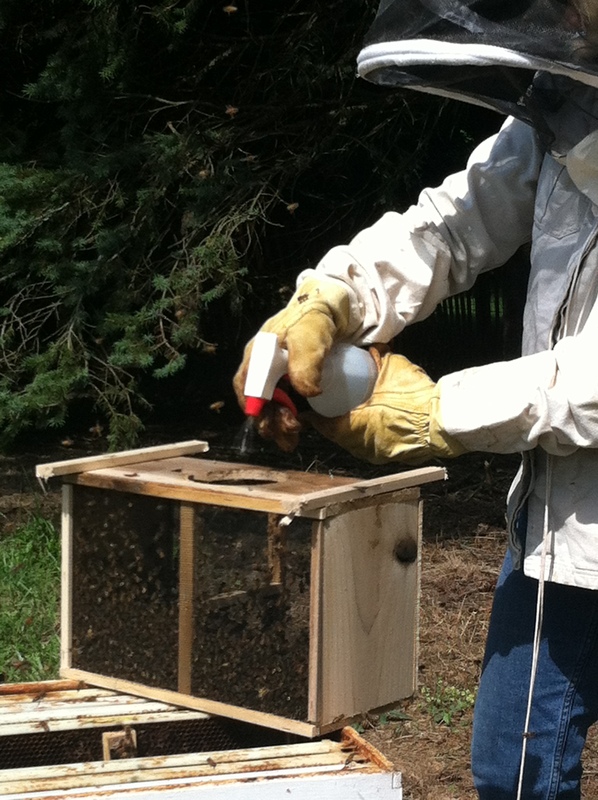 By shaking bees out of different hives, a package is formed which is housed in a screened cage for transport. Sometimes it may take shaking bees out of three different hives to equal three pounds of bees (about 10,000), the standard. 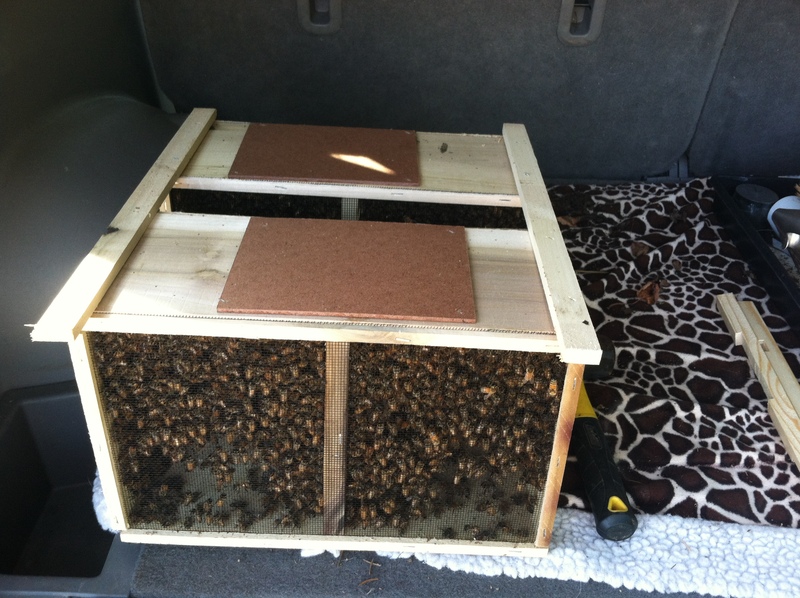 Then, a new queen not related to the worker bees is caged to travel with the new bees. 3. NUC- A nuc is a short expression referring to the nucleus of a live hive. The nucleus, or nuc, usually contains four or five frames from a complete hive. The frames include brood in various stages and frames mixed with honey, pollen and brood. The queen has already been accepted and is the mother of all the bees including the brood in the frames. This is a bee hive in miniature – a working and laying queen is included along with her daughter worker bees, brood, pollen, and eggs. I have gotten honey the same year form my Nucs, so I ordered 2 this year. The best way to acquire a Nuc is to join a Bee Club. Mine is the Central MD Beekeepers Association and they order Bee Nucs every spring from a supplier and transport the Nucs to our Maryland Agricultural Center for pickup for $165 each. 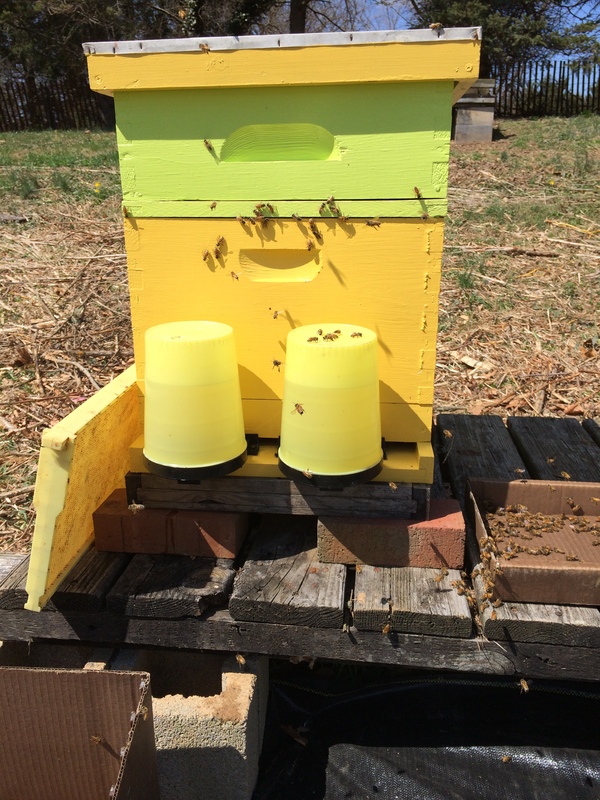 Nucs are the way to go for me, as it is a hive that is ready to go and is already working to bring in nectar during the honey flow. Honey flow is a term used by beekeepers indicating that one or more major nectar sources are in bloom and the weather is favorable for bees to fly and collect the nectar in abundance. For me in the mid-Atlantic, this happens in early to mid-May and can last for a couple of weeks and is always heralded by the blooming of Black Locust, Robinia pseudoacacia. An unassuming tree that spends most of the year in the fringe woods on the side of the road and one late Spring day it throws out a hanging truss of stunning white blossoms. But not just blossoms! The intense fragrance wafts in the breeze and finds you if you are walking down the road and will drift far from the tree. Springtime time is also the critical time for swarms- May is swarm month for me! Go to Swarming of the Bees to see how to capture swarms. It is really important to remove and install the frames in the exact order that they are in the original box. And the weather should be at least 5o degrees or higher. Today, I was working in sunny 65 degree temperatures which is picture perfect. When you remove the frames, it gives you the opportunity to look for brood, honey storage, and the queen. Here is a video on installing a nuc into your own hives. Whenever you work with bees, move smoothly-like you’re doing Tai Chi! 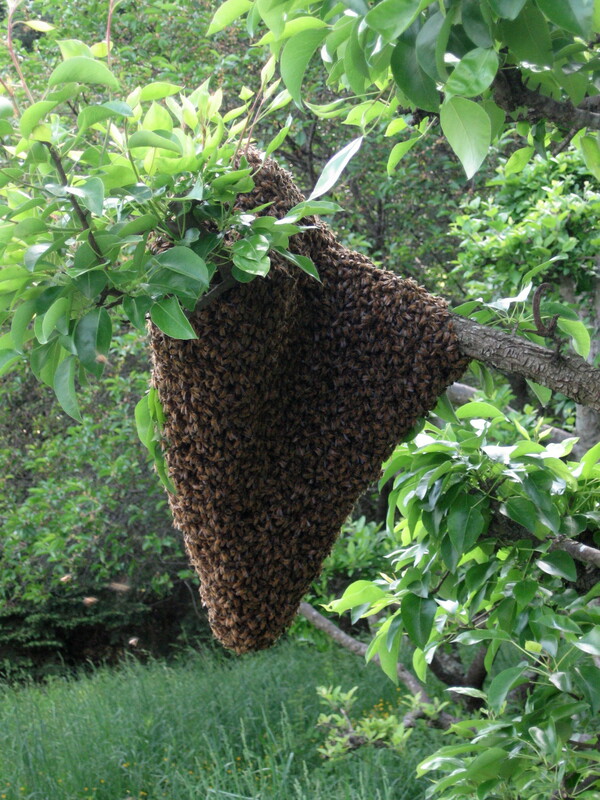 Bees will only sting if they feel like you are threatening your hive, and fast and jerky movements will put them into attack mode. Use your smoke sparingly as the only bees that will sting are the guard bees on the periphery at the entrance and at the top of the frames. If bees come at you and give you a “bump” on the face veil, this is their warning prior to trying to sting and it is best to back off before continuing. Move slowly but surely, not clumsily as this can lead to losing your queen and thus your hive. Once you move over all your frames to your equipment, there will be stragglers, so I place the Nuc box on its side in front of the hive and by dusk, everyone is tucked up for the night. Sugar water, 1 part table sugar to 1 part water, is fed to the bees for the first couple of weeks until they can easily find nectar sources. Supplementary feeding is critical to the success of your colony. There are sparse nectar sources in early April, and I like to feed until I see plenty of flowers out there, probably in about 3 weeks. I continue to feed with sugar water and will inspect the entrance to the hives every day to make sure that there is a good traffic flow, both in and out. That tells me that everything is working well. If there isn’t the normal flow, I will inspect the hive to see if there is a laying queen. 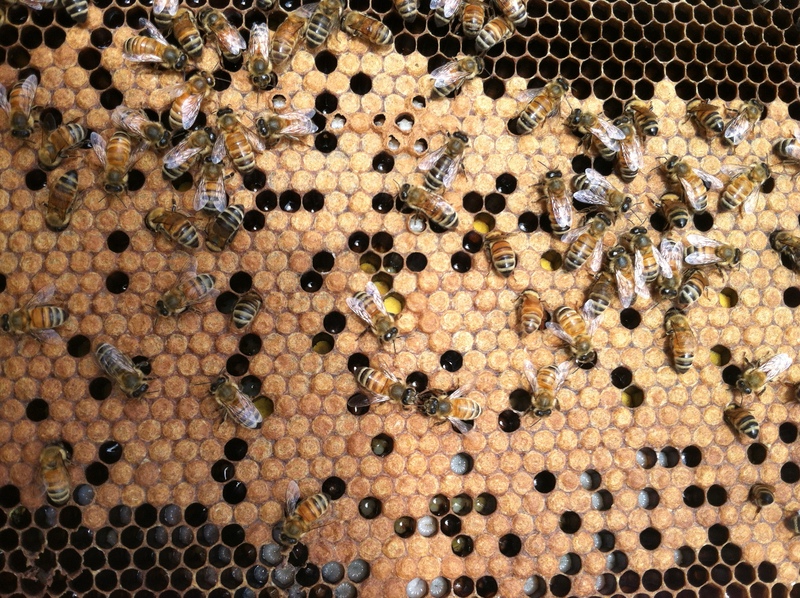 In about a week, I will open the hive and check the brood pattern and see if the bees are drawing new wax comb. If everything seems OK, I will continue to feed the hive for several more weeks while they are drawing the wax comb and then taper off the feeding. I believe in minimal handling of the hive. Leave it to the bees! And harvest the honey! what a wonderful informational blog, thank you.